Star Trek: Enterprise is a very divisive topic among Trekkers / Trekkies. Personally, I'm not a big fan. It was a perfectly adequate space adventure TV show, but just never quite worked as hard science fiction for me, let alone as "Star Trek". There were certainly some stand-out good episodes. The haunted space station of "Dead Stop" and the mirror universe antics of "In a Mirror, Darkly" being among my favorites. The annoying thing is that the show made several mistakes at very fundamental levels before it even got off the ground. I could have lived with the show being a prequel, but the efforts to make the show seem both futuristic to the viewing audience, but also less advanced than the (then 40-year-old) original series put the show in an awkward juxtaposition with established series continuity. The hackneyed time travel meta-plot certainly didn't help. "Juxtaposed" is an excellent way of describing Enterprise as a whole. 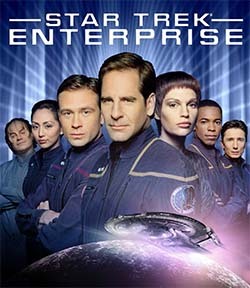 It's a show that simultaneously seemed ashamed of its "Star Trek" name (remember, it premiered with the title "Enterprise", and "Star Trek" was only stapled back on in later seasons), while also indulging in needless - and sometimes cringe-worthy - fan service (such as the appearance of the Borg, Ferengi, and the entire episode "In A Mirror, Darkly"). It wanted to distance itself from established Trek tropes, but also brought back many of the same technologies, concepts, and character archetypes (simply renaming many of them). It set itself at the cusp of development of advanced science fiction technologies, but completely waffled when it came to telling hard science fiction stories about those technologies. It wanted to be simultaneously a prequel and a sequel via its contrived time travel premise. It was this lack of confidence and true vision that really killed this show. 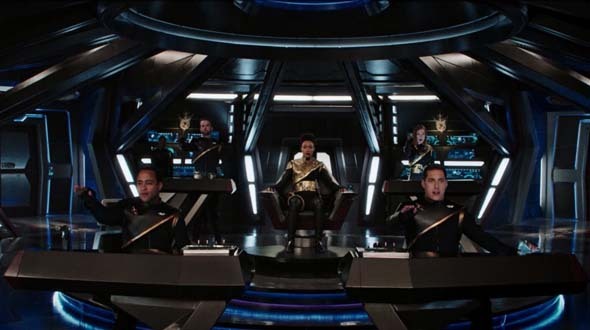 The show made the mistake of trying to present a Star Trek setting that was less technologically advanced, but still went ahead and gave the crew access to stand-ins for all the established trek technologies. They tried to make the Enterprise itself feel more like a contemporary submarine with its confined spaces, but it never really felt different. There was "hull polarization" instead of shields, and "phase cannons" instead of phasers. Different names, but same basic concepts that were used in exactly the same manner. The crew didn't start the show using more contemporary-seeming projectile weapons - not even a futuristic projectile weapon like a rail gun - before transitioning to purely energy-based weapons. 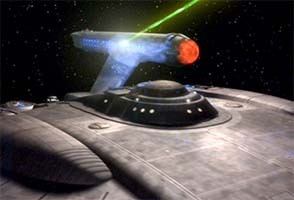 The Enterprise didn't have to be equipped with any kind of futuristic chaffe in order to misdirect hostile targeting scanners, nor did it use point-defense to destroy incoming missiles. 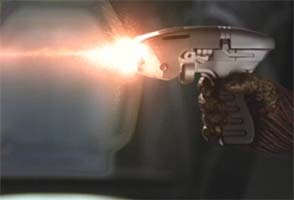 "Phase pistols" and "polarized hull" were just lazy stand-ins for phasers and shields. The only pieces of tech that the show really held off on (and were relevant to narrative) were the universal translator and transporters. The translator was rarely an issue since Hoshi was practically a Babel Fish. The transporter was there, but it was not trusted to reliably transport living things - even though it had been verified as safe by the beginning of the first episode and was successfully used in that episode. So for most of the show's run, the crew used shuttle craft for away missions, but the transporter was always there just waiting to act as a deus ex machina to get the crew out of a sticky situation (which, of course, happened on multiple occasions - including the premiere).